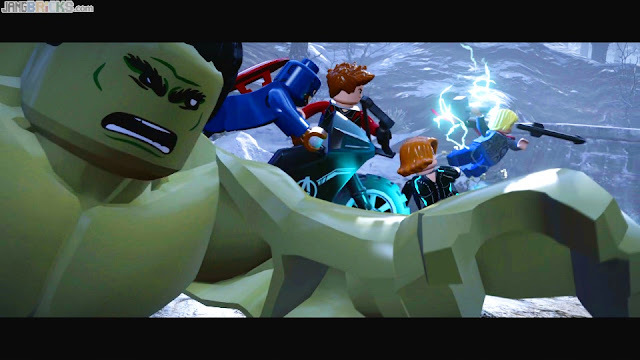 This really isn't about the LEGO Avengers game, but as my son watched this video today it reminded me of him watching you play the LEGO Jurassic World game, and it occurred to me that I wanted to say thank you. My son has watched your videos for a long time and really enjoys them. My son is 9 and on the autism spectrum. He is afraid of a lot of things, and his entire life he had been terrified of dinosaurs. He would hide his face and insist on leaving the room if he saw one in a museum. He wouldn't look at dinosaur books. He wouldn't even play with toy dinosaurs. He was really scared. Unsurprisingly, he did not want to see Jurassic World even though many of his classmates talked about it. Then he saw you playing the LEGO Jurassic World game. Because he watches all of your videos, he watched that one too, even though he was so scared of dinosaurs. As he watched you play through the different movies he got to thinking maybe dinosaurs weren't so bad. He decided he wanted to play LEGO Jurassic World himself. Then he wanted to see the movies. And now he *likes* dinosaurs. A child who once fled from all representations of dinosaurs now frequently pretends to be one. He tolerated exposure to dinosaurs because he wanted to watch your videos. It may not sound like much, but when you have a child with a history of fearing things as non-threatening as fluffy white clouds and exposed ceiling rafters, being able to cross any fear off the list is significant. Thank you.